What is Mineral Makeup, and its benefits for your skin? Mineral makeup contains micronized or ground and milled tiny particles of iron oxides, talc, zinc oxide, and titanium dioxide. Mineral makeup usually does not contain emollient oils and waxes, fragrance, and preservative ingredients which can be found in conventional makeups. 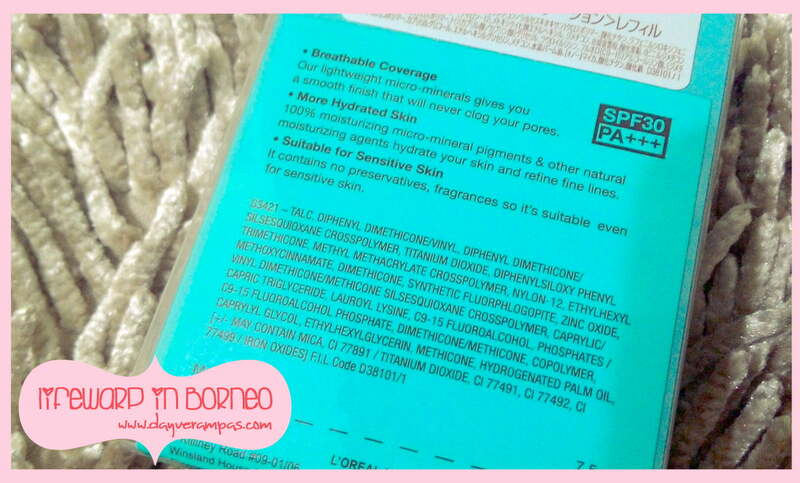 Furthermore, mineral products are usually preservative-free, and fragrance-free which do not cause skin irritation. Mineral does not clog the pores but it won’t heal the pimples/acnes. Mineral makeup will not last as long on your face or be as durable as conventional makeup because it doesn’t contain standard cosmetic agents. Our lightweight micro-minerals gives you a smooth finish that will never clog your pores. 100% moisturizing micro-mineral pigments & other natural moisturizing agents hydrate your skin and refine fine lines. Contains no preservatives, fragrances, or oils so it’s suitable even for sensitive skin. 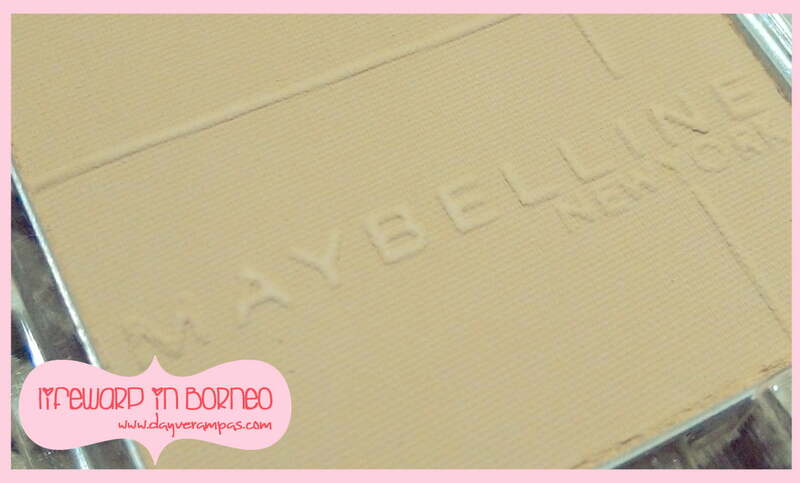 Since I only received the refill pack, so I’m going to review on the powder (not the packaging, of course!). I’ve tried applying this for week on light, and heavy make-up. When I say ‘heavy’, it means I apply this product together with primer, concealer, and foundation to test whether it really gives me a smooth finish as the product claims. I must say that this product does not give my skin a perfect ‘smooth finish’ and cover all the fine lines. It cannot compliment with other brands, too. It makes my face tad cakey. Due to its mineral characteristics that won’t ‘last long’ on the skin, I have to do ‘touch up’ every 4 hours. It doesn’t last long even when I’m in an air-conditioned room – It makes my skin dry (with obvious appearance of fine lines). My skin started to shine (due to oily T-Zone) after 4 hours. Too much re-application makes me look pasty-faced. It does give me any breakouts on my forehead, and chin. As for light makeup application, I only apply this product on my face, skipping all those concealer, foundation, and so on. I must say that it doesn’t blend on my skin, giving me that uneven shades. Plus, it does not last long on my face. Fine lines are not fully covered. It doesn’t hydrate my skin but giving me that shiny shiny bling bling thingy that I really hate to see. Dry patches can be seen. My face looks washed out after a few touch-ups. It does not give me any breakouts, though. I also tried dampen the sponge with water, and apply it on my face. It gives you a nice coverage on my face but I must say it hardened my powder foundation. Again, it does not last long because of its mineral properties (can’t blame Maybelline, though). It does not give me any breakouts. I must say that I’d prefer using a mineral based loose powder than this compact foundation. It does not cover fine lines especially under the eyes, and ‘smile’ lines. I did try this on my client’s face who are opting to have Maybelline Mineral based makeup, and it doesn’t last longer as she expected. It gives that matte look for less than 4 hours, and re-application or touch up is required. It should be noted that regular touch up would make you have that patsy-faced look (pale, and tired or washed out). During those several heavy application tests, I used L’oreal PhotoReady (both concealer and foundation), BB cream, and also CC cream to test whether this product can compliment with other brands. Alas, I must say that it cannot compliment with other brands. 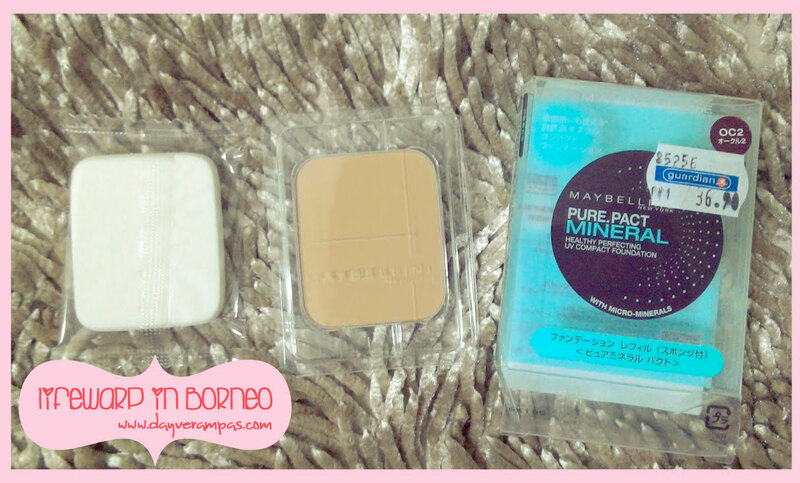 I’m not sure if it can suit with other Maybelline mineral products as I didn’t use any of them in my tests. It’s pretty hard to match with my skin tone. I can’t blame Maybelline, though. It’s the mineral properties that make it’s hard to get a perfect skin tone. I must say the price is a bit pricey just because it has that mineral properties. I won’t buy this product as it doesn’t give the desired result as it has promised.